Taking place before the original 1968 Planet of the Apes films, Ape Society has reached a new golden age, but there are ripples of dissent in both ape and human ranks. Tensions will rise and soon all will be caught in the chaos! Taking place before the original Planet of the apes movies, Ape and Human societies have reached a new golden age, gut peace never lasts for long. Ripples of dissent are spreading in both the Ape and Human ranks and when a mysterious assassin guns down the beloved Lawgiver, tensions will reach a boiling point! Can one human solve the mystery of the Lawgiver’s murder before war engulfs all of society? Oris this the beginning of the end for Apes and Humans alike? 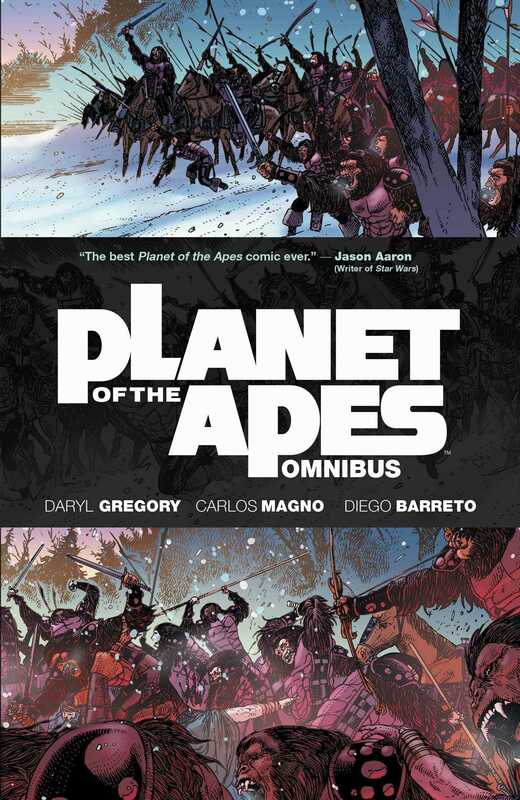 Find out what happens 1,300 years before the arrival of Colonel Goerge Taylor, collecting the entire series for the first time from award winning novelist Daryl Gregory and critically acclaimed Carlos Magno, comes the story of the rise of the original Planet of the Apes!